A cactus is a member of the plant family Cactaceae. The word “cactus” derives, through Latin, from the Ancient Greek “kaktos”, a name originally used by Theophrastus for a spiny plant whose identity is not certain. Cacti occur in a wide range of shapes and sizes. Most cacti live in habitats subject to at least some drought. Many live in extremely dry environments, even being found in the Atacama Desert, one of the driest places on earth. 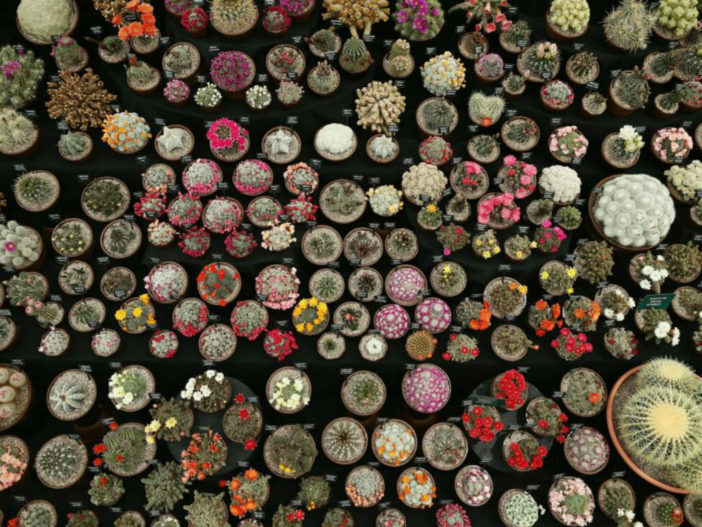 Cacti show many adaptations to conserve water. Almost all cacti are succulents. Unlike many other succulents, the stem is the only part of most cacti where this vital process takes place. Cactus stems store water. Most species of cacti have lost true leaves, retaining only spines, which are highly modified leaves. As well as defending against herbivores, spines help prevent water loss by reducing air flow close to the cactus and providing some shade. In the absence of leaves, enlarged stems carry out photosynthesis. Cacti are native to the Americas, ranging from Patagonia in the south to parts of western Canada in the north—except for Rhipsalis baccifera, which also grows in Africa and Sri Lanka. Cactus spines are produced from specialized structures called areoles, a kind of highly reduced branch. Areoles are an identifying feature of cacti. As well as spines, areoles give rise to flowers, which are usually tubular and multipetaled. Many cacti have short growing seasons and long dormancies, and are able to react quickly to any rainfall, helped by an extensive but relatively shallow root system that quickly absorb any water reaching the ground surface. Cactus stems are often ribbed or fluted, which allows them to expand and contract easily for quick water absorption after rain, followed by long drought periods. Like other succulent plants, most cacti employ a special mechanism called “crassulacean acid metabolism” (CAM) as part of photosynthesis. Transpiration, during which carbon dioxide enters the plant and water escapes, does not take place during the day at the same time as photosynthesis, but instead occurs at night. The plant stores the carbon dioxide it takes in as malic acid, retaining it until daylight returns, and only then using it in photosynthesis. Because transpiration takes place during the cooler, more humid night hours, water loss is significantly reduced. Many smaller cacti have globe-shaped stems, combining the highest possible volume for water storage, with the lowest possible surface area for water loss from transpiration. The tallest free-standing cactus is Pachycereus pringlei, with a maximum recorded height of 63 feet (19.2 m), and the smallest is Blossfeldia liliputiana, only about 0.4 inch (1 cm) in diameter at maturity. A fully grown Saguaro (Carnegiea gigantea) is said to be able to absorb as much as 200 U.S. gallons (760 l; 170 imp gal) of water during a rainstorm. A few species differ significantly in appearance from most of the family. At least superficially, plants of the genus Pereskia resemble other trees and shrubs growing around them. They have persistent leaves, and when older, bark-covered stems. Their areoles identify them as cacti, and in spite of their appearance, they, too, have many adaptations for water conservation. Pereskia is considered close to the ancestral species from which all cacti evolved. In tropical regions, other cacti grow as forest climbers and epiphytes (plants that grow on trees). Their stems are typically flattened, almost leaf-like in appearance, with fewer or even no spines, such as the well-known Christmas Cactus or Thanksgiving Cactus (in the genus Schlumbergera). Cacti have a variety of uses: many species are used as ornamental plants, others are grown for fodder or forage, and others for food (particularly their fruit).